BATTERIEnext ist auf dem zweiten BELVEDERE-Festival vertreten, das vor zwei Jahren erstmals durch FEFÈ initiiert wurde, und vom 22.-23 Oktober 2010 in Rom im IED (Instituto Europeo di Design) stattfindet. Es werden die neuesten BATTERIEnext-Ausgaben und eine Zusammenstellung der PDF-Magazine ausgestellt. Beim BELVEDERE geht es um visuelle Magazine, die Kraft der Bilder in der Kommunikation und neue Sichtweisen. Vorträge, Ausstellungen (u.a. "TOYS?" zum aktuellen Phänomen der Vinyl-Spielzeuge) und Diskussionen runden das Festival ab. BATTERIEnext is part of the second BELVEDERE-Festival - the biennial Festival created by FEFÈ - which takes place from the 22nd until the 23rd of October at IED in Rome. You can take a look at the latest issues of BATTERIEnext as well as a collection of all PDF-magazines. 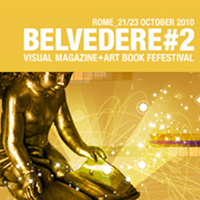 BELVEDERE is all about visual magazines, the power of images in communications and new languages. Conferences, exhibitions (e.g. "TOYS?" about the new phenomena of vinyl and ceramic toys) and meetings sum up the festival. Die »Leere« ist gefüllt und BATTERIEnext_19 kommt rechtzeitig zum Weihnachtsfest zu Euch als Plakat-Magazin. 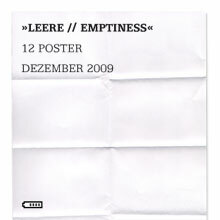 The »emptiness« is filled up BATTERIEnext_19 finally arrives just in time for Christmas as a poster magazine. »Der Mai ist gekommen, die Bäume schlagen aus...« oder so ähnlich hätte es zur neuen Ausgabe von BATTERIEnext heissen können. BATTERIEnext_18 nimmt das Klebeband in die Hand und geht raus in die Welt um sich der »Dimension« zu widmen. »It is spring-time and nature blossoms...« that could have been the slogan for the latest issue of BATTERIEnext, too. 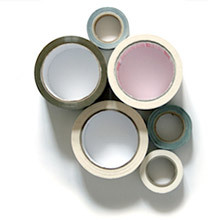 BATTERIEnext_18 picks up some duct tape and takes a walk in the big, wide world focusing on the »dimension«. 2008 ist da! Und endlich gibt es auch wieder eine neue Ausgabe von BATTERIEnext. "1,2,3" ist das Thema von BATTERIEnext_17 und das Medium sind Buttons. Ein "rundes" Magazin zum Sammeln, Anstecken, Tauschen oder was auch immer. finally 2008 has arrived and finally there is a brand new issue of BATTERIEnext with the topic "1,2,3" consisting of buttons. 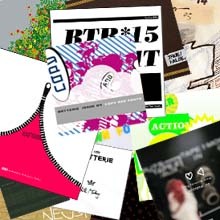 BATTERIEnext_17 is a circular magazine to collect, attach, swap or whatever. Ab sofort stehen wieder alle BATTERIE-PDF-Magazine unter magazine zum Download bereit. Right away all issues of BATTERIE are available again. You can download all of them here. "Goodbye BATTERIE PDF-Magazin" & "Hallo BATTERIEnext Creative Magazine"! "Von A nach B" war es ein langer Weg, aber wir sind am Ziel angekommen: BATTERIEnext_16 ist endlich online. Freut euch mit uns auf 17 ganz unterschiedlich animierte GIFs. "Goodbye BATTERIE PDF-Magazine" & "Hello BATTERIEnext Creative Magazine"! It was a long way "From A to B", but we made it anyway: BATTERIEnext_16 is finally online. Please enjoy 17 completely different animated GIFs with us. 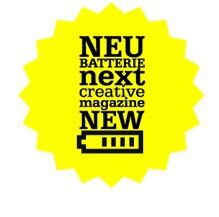 BATTERIE wird zu BATTERIEnext und aus dem ehemaligen PDF-Magazin wird das "creative magazine". BATTERIEnext ist nicht mehr länger auf das PDF-Format festgelegt. Ab jetzt gibt es mit jeder neuen Ausgabe auch ein anderes Medium. Aus diesem Anlass hat BATTERIEnext eine neue, flexiblere und für die Anforderungen des "creative magazines" passende Website bekommen. Schaut euch um und schreibt uns eure Meinung. 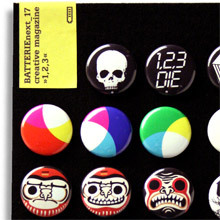 BATTERIE is now BATTERIEnext and the former PDF-magazine becomes a "creative magazine". BATTERIEnext is no longer based on the PDF-format but changes its format with every new issue. Because of this BATTERIEnext has got a new, more flexible and fitting website for a "creative magazine". Take a look and send us your opinion. 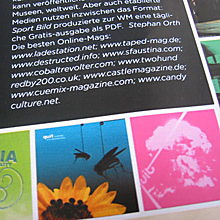 BATTERIE is featured in the august-issue of german popculture and style magazine "Max". We are first in the linklist and have some graphics printed in the article, too. Der DATA PILOT 1.0 ist die weltweit erste Grafik-Design Sticker Compilation. Mit 80 Grafik-Stickern, die 80 Texte zur Kommunikation wunderbar, überraschend, kühn, atemberaubend visualisieren. Sticker und Texte sind mit Liebe gemacht von 150 internationalen Designern, Gestaltern, Textern, Fotografen, Autoren aus der Schweiz, Deutschland, USA und Österreich. Darunter klingklangvolle Namen wie Kurt Weidemann, Fons Hickmann, Beat Gloor, Büro Destruct (und auch Andreas Magino von BATTERIE). 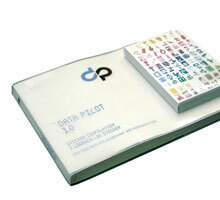 DATA PILOT 1.0 is the first graphic-design sticker compilation world-wide. With 80 graphic-stickers and 80 texts about communication which visualise surprisingly, keen and breathtaking. All stickers and texts have been made with devotion by 150 international designers, copywriters, photographers and authors from Switzerland, Germany, USA and Austria. Besides a lot of other people you will find names like Kurt Weidemann, Fons Hickmann, Beat Gloor, Büro Destruct (and Andreas Magino from BATTERIE, too). BATTERIE war im Radio. Bei Radio Q war im Juli ein kurzes Interview mit Tobias Waszkiewicz zu hören. BATTERIE was on air. A short interview with Tobias Waszkiewicz was aired at Radio Q this juli.